The crew gets sucked into a right Monster-Mash. With a guest appearance by our old pal, the Flash. Barry tries to clean up the mess. Whilst they begins to feel useless. Leaving Doctor Destiny taking out the trash. Yeah. Him. Or the Writers: Ray Fawkes, Jeff Lemire; the Artist: Mikel Janin; plus the Publisher: DC Comics, in May, 2013. Using GENERAL terms, answer the following 4 questions about this SECOND PART OF 'Horror City'. 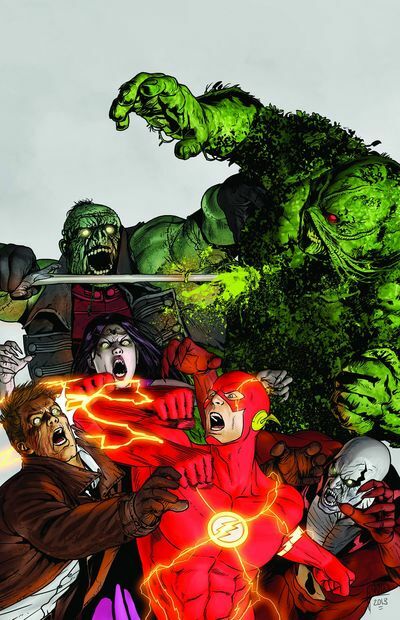 WHAT'S THE MAIN THRUST OF THIS TALE: Once The Flash gets The Justice League Dark out of sh*t street, together, they have to do a spot of spring cleaning in a world not akin to our own. ARE THE MAIN OBJECTIVES ACHIEVED: Oh, definitely. Although the team’s eventual discovery of their villain leads to a twists that's a bit too enticing to leak. As it’s hard to tell if this issue is to show how all-powerful Flash really is -- yet if it is -- mission accomplished. HOW DOES THIS STORY END: With Xanadu face to face with human-beef-jerky, and with Swampy like veggies left out on a barbecue for far too long. All in all, what is the most memorable SENTENCE OR CONVERSATION spoken in this issue. ...it reminded me of the Venture Brothers, who say 'the family that slays together, stays together'. Also, if Frankie can't keep his own title, his few tidbits in other series better be gems -- and so far, so good. (+) The Flash is always a welcome guest no matter what book he shows up in. As much as I play on his overpowered thing in this yarn, it’s an entertaining sight to see the crew eat humble pie for a change. (+) Deadman's 'snark' is something I've been needing more of, and this issue seem to have a pretty decent dose of it available. Lovely. (+) Frankie and Constantine still can’t stop stepping on each other’s toes, and I'm okay with that. Ha! (+) Mikel Janin draws a great looking Flash. It's as though he's channeling the Wally West version from the Justice League Animated Series. (-) Swamp Thing is a very-very soggy looking character in this issue. He's supposed to be a super-powered being, right? Yet in this adventure he's as useful as a wet towel in the bath. (-) Doctor Destiny, whilst powerful, appears kinda cookie cuttery and campy, and I’m not sure that’s what I'm supposed to be feeling towards him. Know what I mean? (-) I always have a hard time with stories that have an entire city wrapped in tentacles and monsters, where only a handful of super people notice this. Hmmm? THE CLASH AS CONSTANTINE: This is a tad too easy and a tad too obvious for me, eh? But British, punk, and a constant careless attitude makes for a mirror image in my eyes. J.G. THIRLWELL AS DOCTOR DESTINY: I used J’s voice and a number of scary beats whilst reading this issue. Even though I think I fear Thirlwell much more than the Doctor. (NOT ADAM) BY FOETUS: You need something to really grasp that delightful sense of disgusting, and this australian guy has just the thing. I always envisioned my own story to this tune, involving a summer camp invaded by a pack of zombies. But superheroes fighting nightmares works too. I know magic is this team’s forte, but I'm curious if we can take them out of this situation for a short while. I feel it would give the crew some very interesting dynamics. Moreover, if they're losing Zatanna and Orchid, the Justice League Dark needs to find more teammates. Maybe a fellow of the Animal Man persuasion perhaps? Just sayin. Furthermore, Frankie gets to slay pseudo Constantines, make jokes, and smashes like Hulk, and still no smile? Which is long overdue. Shame. GIVE IT, IT'S DUES: If This Comic Book Was An Olympic Skater, It Would Perform All The Snazzy Moves & Tricks, Yet Would Put On A Show That Seems Oddly Similar To Its Older Material. *** This post was written by the one and only Freakin' Animal Man.